One of the region’s most unusual birds is the subject of a research project by University of Rhode Island doctoral student Erin Harrington, and she’s seeking at least 80 volunteers to become citizen scientists to contribute to her work. All it takes is a commitment of 38 minutes at dusk on four dates between April 20 and May 10, plus attendance at a two-hour training session. Participants in the research project will listen for the mating call of the male woodcock, which Harrington described as a nasal peent. It’s very distinctive. They also perform what she calls a sky dance, an elaborate aerial display that includes a twittering sound made by their wing feathers. However, they only perform these rituals for a short period at dusk. They also like to dance on the ground. 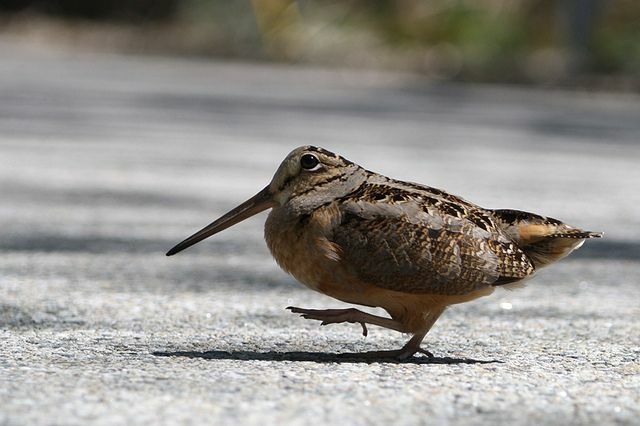 Using a protocol developed by woodcock researchers elsewhere, participating volunteers will drive a designated route, stopping every quarter-mile to listen for the birds for 2 minutes before proceeding to the next stop. Depending on weather conditions, volunteers must start the route exactly 15 or 20 minutes after sunset and be finished within 38 minutes, before it gets too dark and the birds stop displaying. “After we have a few years of data, we hope to have better information about where they are, where they aren’t, and where they are in high numbers, and apply that information to forest management,” Harrington said. Training sessions are scheduled for Tuesday, April 3, and Friday, April 6, from 6-8 p.m. in Weaver Auditorium in the Coastal Institute building on the URI Kingston campus. For more information about the project or to register as a volunteer, send an e-mail to Harrington at e_harrington@my.uri.edu or visit Project Timberdoodle.